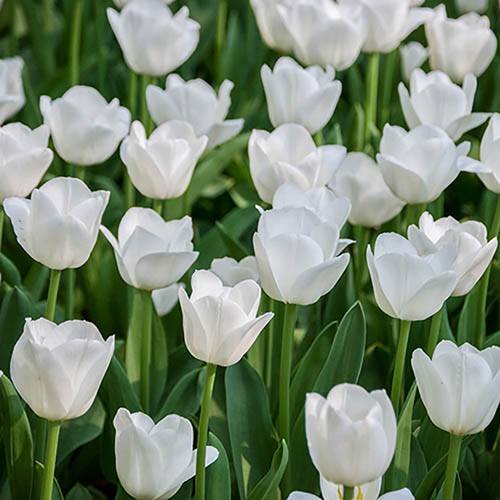 This brilliant white coloured tulip is incredibly versatile, very strong and sturdy. This brilliant snow-white coloured tulip is incredibly versatile, strong and sturdy and grows in the classic tulip shape. It's bright white flowers contrast perfectly with deeper coloured varieties such as 'Queen of the Night' or 'Scarlet Baby'. Tulips are perfect for mixing up with different colour varieties to give your garden, patio, pots and containers a spring makeover. Tulips also make great cut flowers too, brightening up the house in vases on windowsills or on a mantelpiece.